A special thank you to Edelweiss, NetGalley, and Houghton Mifflin Harcourt for an ARC in exchange for an honest review. 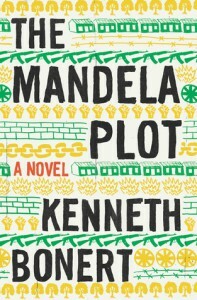 Set in 1980s South Africa, The Mandela Plot centres around Martin Helger—a student at an all-boys private school in Johannesburg that doesn't quite fit in unlike his brother who is a mysterious legend. Martin is bored with his mundane life until a beautiful American girl, Annie Goldberg, arrives. Martin finds himself no longer in his protective bubble and is immersed into the political and societal struggles. Oh boy..where do I start? I had the honour of reviewing Bonert's first book The Lion Seeker and it was a stunning debut. But this sophomore effort coming of age tale just simply didn't resonate with me. Honestly, I can't put my finger on it—perhaps it was the dialogue? It was very hard for me to get into the book with several failed attempts and start overs. That being said, once I did get into the story, I did enjoy parts of it. The characters are complex, some are well-developed, and others, like Martin are underdeveloped. Bonert clearly has a gift; there are some beautiful passages, but the lengthy paragraphs are unnecessary bulk and the slang stunts the reader (of note: there is a glossary at the end of the book).